The Golden State Warriors finished off a strong 2014-15 NBA season by de-throning King James and winning the title. 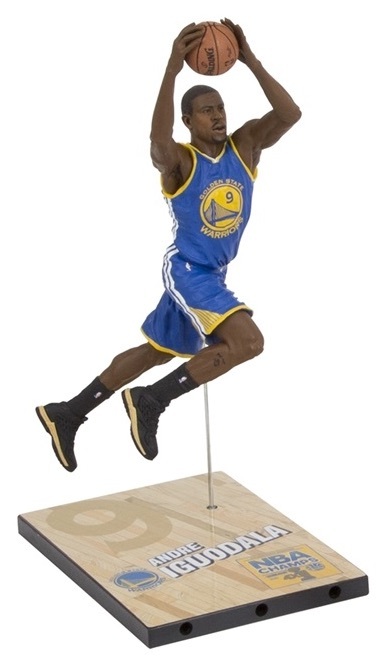 Honoring that achievement, the 2015 McFarlane Golden State Warriors Champions NBA Sports Picks Figures features three key names from the Warriors' title run, including Stephen Curry, Klay Thompson and Andre Iguodala. Led by the "Splash Brothers," two of the top young stars in the league, Stephen Curry and Klay Thompson are no strangers to the collecting world. In addition to a good amount of cards, Steph Curry's Sports Picks debut came in McFarlane 24 and Klay Thompson will appear in McFarlane 27. 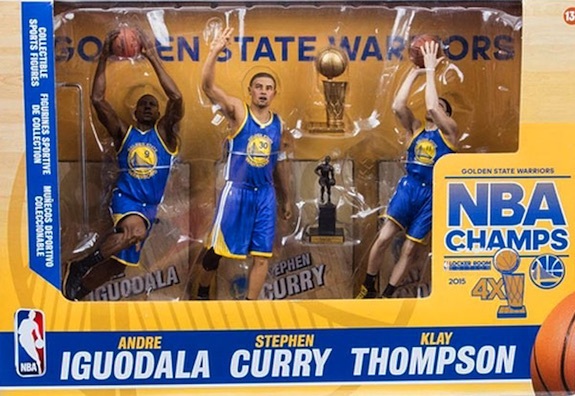 While none of the players are first-time inclusions, the 2015 McFarlane Golden State Warriors Champions offers the first chance to acquire Finals MVP Andre Iguodala as a member of Golden State. Iguodala does have previous figures from his time with the Philadelphia 76ers. One of several Golden State Warriors collectibles issued to celebrate the win, the McFarlane Golden State Warriors Champions figures each come with blue uniforms that feature the official NBA Finals patch. The Golden State Warriors championship logo is showcased on the figure base. Also, each set includes a replica Larry O'Brien Championship Trophy and a MVP trophy for Curry. mcfarlane NBA Golden State Warriors Series 32 Stephen Curry Action Figure.#3 50. Stephen Curry Golden State Warriors McFarlane NBA Series 32 Figure Variant 1750.